Aaron Ramsey ended Arsenal's nine-year trophy drought on Saturday, completing his team's comeback in extra time in the FA Cup final to secure a 3-2 victory over Hull. It threatened to be an embarrassing day for Arsenal at Wembley Stadium when the London club conceded twice in the opening eight minutes against a Hull side which has never won a major trophy in its 110-year history. But after goals from James Chester and Curtis Davies, Santi Cazorla began Arsenal's fightback in the 17th minute by scoring directly from a free kick. Laurent Koscielny took until the 71st to equalize and force the game into extra time, where Ramsey completed a slick move to score the goal that will ease the pressure on manager Arsene Wenger. 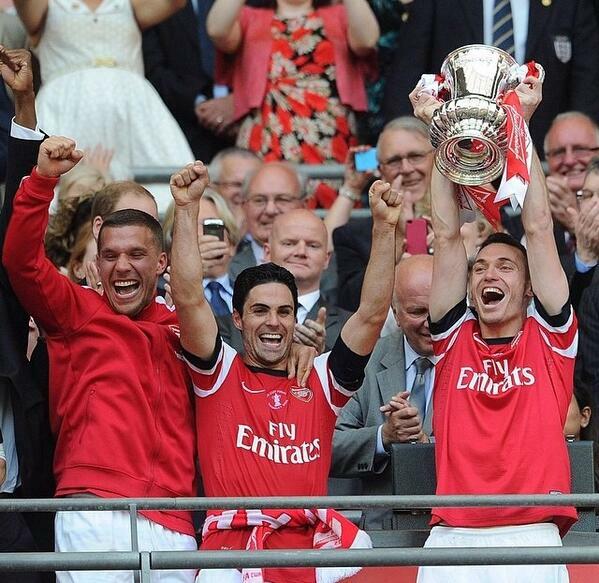 "Nine years we have been waiting for this trophy," Wenger said on the pitch. "I think we deserve this trophy and hopefully in the next few years we will be stronger." Arsenal's repeated failures in the Premier League since winning it in 2004 and the drought in knockout tournaments since lifting the 2005 FA Cup had thrown Wenger's future into doubt. But Saturday's victory will increase expectations that the Frenchman will commit to club he has managed since 1996, having already indicated he will sign a contract for next season.